CATEGORIZATION (or stratification) is the process by which we classify our vendors and group similar ones together such as Banking Technology, Financial Services, Communications, Appraisers, etc. And since many large vendors provide multiples services, further categorizing the Services within the Vendor Categories provides the foundation for being able to conduct a true apples-to-apples comparison of vendor risk, performance and value. 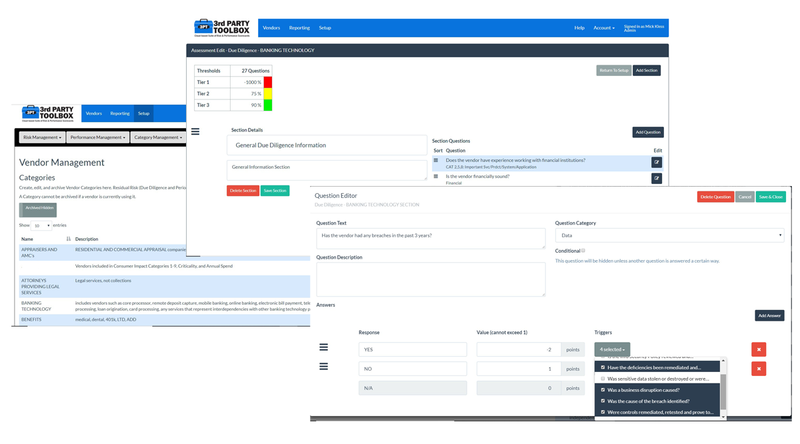 Streamline your risk questionnaires and only ask what applies to what the vendor really does. Get rid of those laundry lists of unnecessary questions! Pre-configured with 15 fully editable vendor categories and questionnaires for Due Diligence and Periodic Review. Use ours and build your own.